Gourd: Any of several trailing or climbing cucurbit plants bearing fruits with a hard rind, especially Lagenaria siceraria and a variety of Cucurbita pepo. Authorities believe gourds originated in ancient times in Africa. They then spread to other continents by various means. This century Italy-Sicily seems to get the most publicity for their popularity. A Long Gourd simply is a gourd that grows long – How Long? 2013 Fred Ansems of Steam Mill sets a new World Record capturing both 1st and 2nd place with his 139.25” and his 137.5” Long Gourds. 2014 A film crew from the Food Network came to Steam Mill and the AVGVG Glad Gardens Weigh Off to film a segment about growing long gourds and the competition for their show “Outrageous Giant Vegetables “ which aired many times throughout North America. 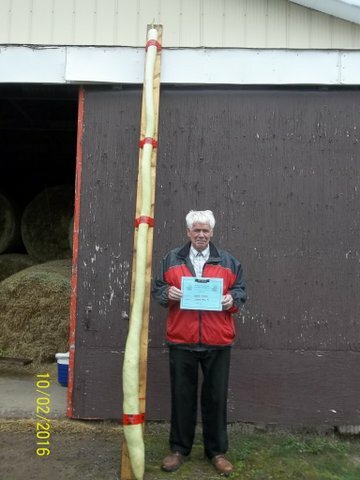 2015 Ron Muis also of Steam Mill grew a long gourd measuring 149.25” which at the time we all thought would be a new world record however Al Eaton a former Nova Scotian now living in Ontario grew a Long Gourd measuring 149.5” beating Ron by .25” and setting a new World Record . 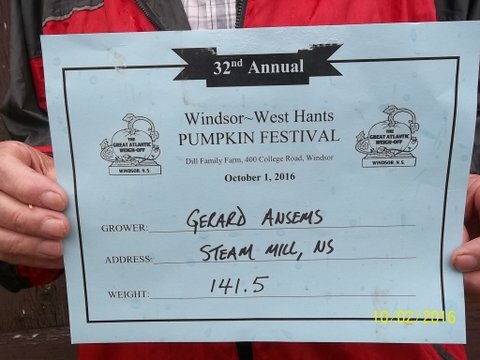 This brings us to 2016 and once again Steam Mill is Number 1 in the world with a Long Gourd measuring 141.50”. This Long Gourd was grown by Gerard Ansems of Steam Mill and this gourd was grown from his son Fred’s World Record seeds. Gerard this year also took home other prizes like top pumpkin at the Dill Weigh Off weighing in at 1350 lbs, Heaviest Watermelon 98 lbs , and at the AVGVG Glad Gardens Weigh Off another Long Gourd at 132.63” and Heaviest Tomato at 3.75lbs. To complete this families love of growing giant vegetables Gerard’s wife Catharina Ansems had the top pumpkin at the AVGVG Glad Gardens weigh off at 1368 lbs.